Grease and flour or spray with baking spray a 8x8 inch pan. In a large mixing bowl, sprinkle the yeast on the water. Using an electric mixer with a dough hook combine the yeast, butter, sugar, and egg. Add the flour alternately with the milk and mix on low until smooth. The dough will be a bit sticky. Spread the dough out into the cake pan, taking care to reach all corners. Arrange peaches in a single layer, cut side up over the dough. Press the peaches into the dough. Cover and allow to sit 30 minutes to rise. Preheat oven to 350. Bake for 30-40 minutes or until the cake is cooked through. Remove from oven and immediately brush with jam. Every August like clockwork, I get a flurry of requests asking for a recipe for Baltimore Peach Cake and I haven't had one to share until now. I've thought about making it each year but either time got away from me before peach season ended or we had a bad peach year. This year the peaches are amazing so when I found myself with a bunch of peaches and received yet another request for a recipe over the weekend, I knew it was time. 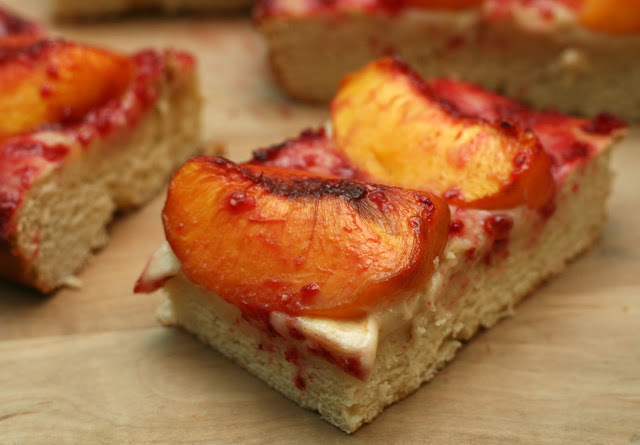 I remember my Grandpop picking up peach cake at Hoehn's Bakery in Highlandtown when I was little. And the twist doughnuts with the granulated sugar. Honestly, I don't know if I ever actually made it into Hoen's because he would leave me in the car (normally with the dogs because we'd stop for a treat to take to our little house on Bird River) while he picked up the goodies. But he loved peach cake and made the effort to pick it up when it was available. Peach cake is one of those uniquely Baltimore things that I am always worried is in the process of dying out, like smearcase. It is only available for a month or so a year as it is and I haven't seen a really good recipe for it yet. Most people think of it as a bakery-only cake but only a handful of bakeries in the city still make it. So I felt the need to create one. At Hoehn's the secret ingredient is raspberry jam* so I spent a day making jam just for this cake. I cheated a bit and added peach to it but I think that makes it even better for peach cake if slightly less traditional. Some bakeries use a sort of sugar glaze on their cakes, but that makes it too sweet for my taste and I think it detracts from the flavor. With raspberry jam you get a hint of another summer favorite! Peach cake is unique in that it is a yeast based cake and in the giant slab format that old time Baltimore bakeries seem so fond of rather than a neat round cake. This makes it easy to slice nice big square pieces and maximize the amount of peaches used. I don't find that peach cake holds up for many days so I think making a smallish cake of 8x8 works out the best if you are making it for home consumption and not trying to feed all of East Baltimore. 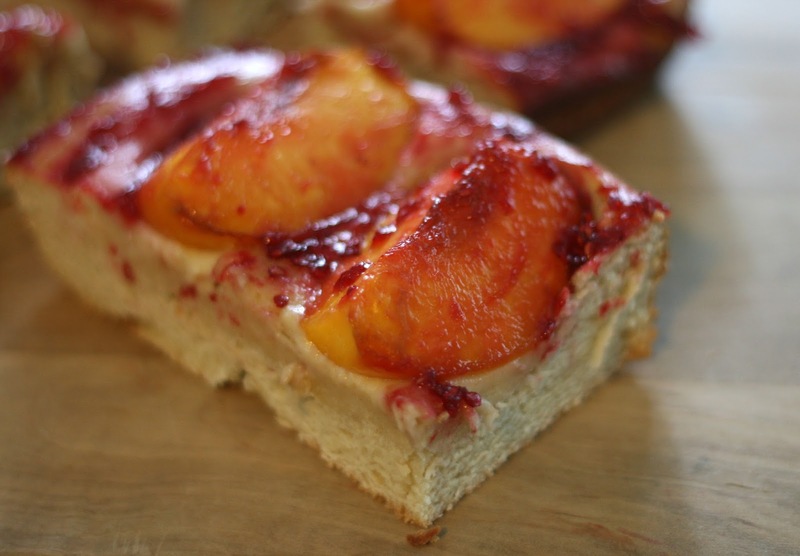 You can always make more, but the perishable nature of the peach means this cake is best the day it is made. I've seen slabs of peach cake much larger than 9x11 in bakeries around Baltimore! *Some peach cakes do not feature jam but when they do, it is often raspberry. I think the jam was introduced to help extend the short shelf life of the cake by sealing in the juices. Since the cake Grandpop would buy featured jam and I make my own jam, I included it. You can leave it out if you prefer.